I work with clients to meet their needs for a standard paint theme or for an original paint creation. Price depends upon size, complexity, and mediums requested. Paintings can be completed on a variety of substrates such as fine art papers, canvas, gesso panels or hand-made gesso boards. 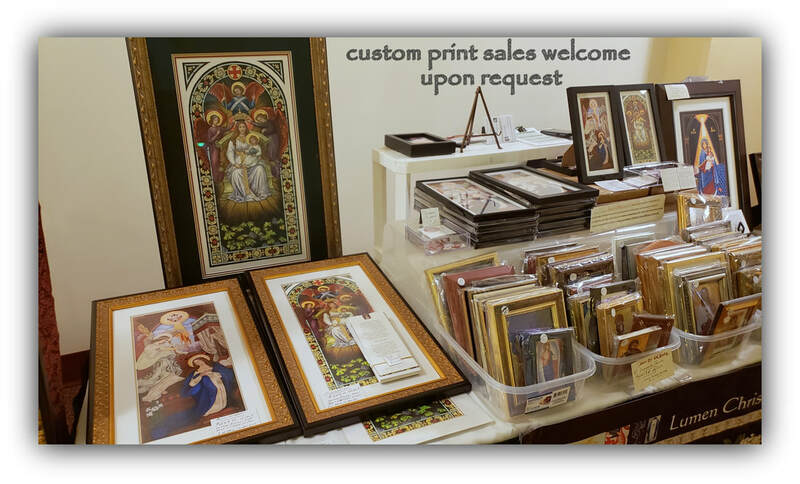 Featured Art Having toured countless church and historical sites, I have accustomed myself to overhearing the inevitable exclamation of viewers who marvel at the craftsmanship and methodical excellence of bygone era arts. Typically one might begin by saying something like “they don’t make these like they used to” implying some lost quality. The laments are understandable and often true. I too admire the value of refined historical artworks, but I also have the skills to recreate some of these classics, in paint, for a new and future generation. As you see here, I have photographed and then completed the tedious part of rendering a line cartoon as it is called. Next will be the beautiful painting part. Annunciation Conceived in a time of high faith, the timeless beauty of 19th and early 20th-century religious, stained glass windows are appreciated for their overall excellence. Only recently one particular window truly captured my attention. It is part of an monumental Marian visual narration of ten windows based on the life of the Blessed Virgin Mary. Converted to Paint Annunciation will be completed on a 1/8" ultra smooth, hardwood panel of "16x36" using the vibrant, rich and time-tested egg tempera paint technique and most suitable for framing. To translate stained glass art into precision paint art, all of the lead lines and window dividers will need to be "erased". Updates HERE. Look for more prayerful paintings of this quality & kind in the future. Please note that I am able to recreate only those images that are public domain. For a contemporary selection, please refer to the original artist or commission me to render a completely new image. As well I am able to present any image to translated in to a stained glass work through a traditional stained glass art studio that I have access to. 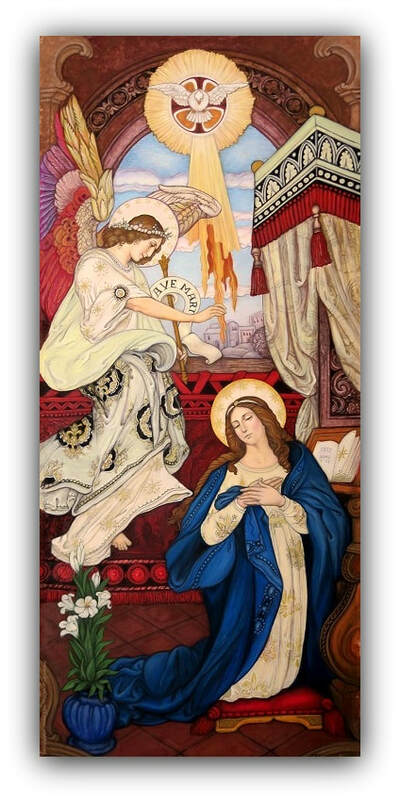 Annunciation Painting or another: Inquire. The completed painting. The actual frame is on the right. Giclee prints upon request, various sizes. Inquire. Egg tempera technique is a method of mixing powder pigment with an egg binding agent. I find it to be sumptuous and so I most often employ it, but not exclusively. Synthetic binders blended with pigments and other materials work splendidly for certain types of presentations. In this case, the paint medium comes premixed or is custom mixed by myself using a professional quality, acid-free, synthetic binder. Additionally, jewel-like, illuminated manuscripts of any traditional kind and using traditional methods, can be completed on authentic calfskin vellum, museum grade papers, Bristol or whatever the client requires.